In 460 BCE, Athens became embroiled in a complicated Egyptian revolt against their Persian overlords. 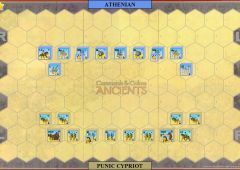 After Libyan mercenaries under the command of Inaros seized control of Egypt and sent entreaties to Athens, the perennial enemy of Persia, for assistance, Athenian support arrived in the form of an expeditionary force under the command of Charitimides. 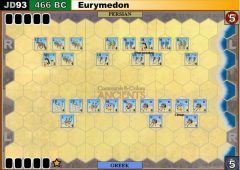 Although ancient historians offer different accounts of the campaign, Diodorus’ account mentions a major land battle at Papremis, between the polyglot army of Libyans, Egyptians, and Greeks fighting against the Persian army under Achaemenes sent to retake Egypt. 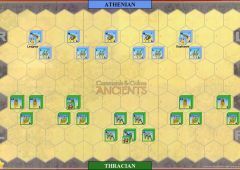 In the ensuing battle, the Greek hoplites, working in conjunction with their newfound allies, shattered the Persian line and killed Achaemenes, a relative of King Artaxerxes. 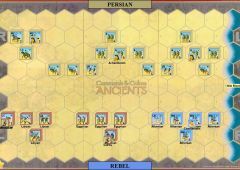 The remaining part of the Persian force were besieged in Memphis until the following year, when the Egyptian rebels were eventually subdued and the Athenian expeditionary force crushed at Prosopitis. The Nile River is impassable. Rebel Leadership: If any leadership card is played by the rebels, only Inaros may simultaneously command units of all different nationalities. 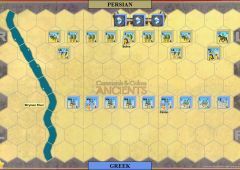 Amyrtaeus may command Libyan (Carthaginian) and Egyptian only, while Charitimides can only order Greek units. Otherwise, units can be ordered in combinations as usual (line command, outflanked, etc. ).